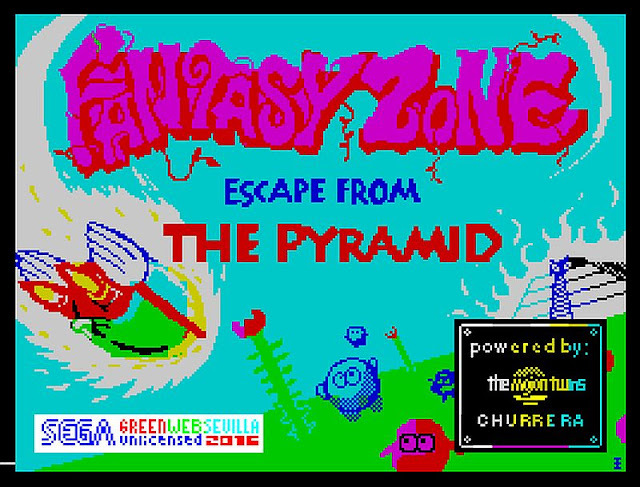 As if Doctor Who Surrender Time wasn't enough for Errazkin, as earlier today he contacted us via our Twitter page to let us know that Fantasy Zone: Escape from the Pyramid has been finished and released for the ZX Spectrum! According to Errazkin, this game is the final version of a game that was made some years ago by Antonio J Pérez, that now features "in game" music in the 128k version by the same creator as well as a new loading screen and another for the end of the game made by Igor Errazkin! In this game a strange force has pulled Opa Opa into a parallel dimension where lots of enemies guard the Great Pyramid that cause spatial-temporal changes in the Fantasy Zone. Only by flying about, shooting at enemies and avoiding smacking into deadly mines, will you activate the 5 great stars to be able to return home for lunch, where a succulent meal is waiting for you. The game features a lovely tune throughout, cool level designs with some very challenging levels that await, and smooth controls enabling the ease of destructive firepower!